It's time for a new vehicle, so there are a number of things to consider. You can stick with a larger vehicle as usual, or dare to embrace something sportier to get you around St. Petersburg. 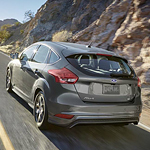 If your choice is that latter, then you may want to give the Ford Focus a closer look. There are a number of things that make the Focus a great car to drive. The Focus SEL, for example, includes a number of exiting features. These start with a 2.0L Ti-VCT engine that delivers the right amount of power just when you need it to. The Focus SEL also makes your time in the cabin more enjoyable and sonically pleasing. A visit to Ted's Auto Sales will reveal the included audio system that is built by Sony. This includes an HD radio and 10 speakers that engulf driver and passengers in a rich crisp dynamic sound.